Dinner in a wine cave. Check! One more thing off the bucket list! We had a lot of amazing experiences at this year’s Wine Blogger’s Conference in Santa Rosa, California. However, the unparalleled highlight was the Friday evening dinner at Thomas George Estates. When the list of dinner excursions was published several weeks earlier, we scanned the host wineries’ websites, and noticed that Thomas George Estates has a wine cave. A telephone call to the winery confirmed the WBC Dinner would be held in the cave. We made our reservation immediately! With eager anticipation, we boarded the luxury wine-tour bus and settled into the plush leather seats. Under the soft mood lighting, we enjoyed the short ride to the winery. Upon arrival, we stepped off the bus and into the cavernous entryway of the cave. There, we were warmly greeted by Thomas George Estates staff, who handed us each a glass of their 2014 Brut Blanc de Blancs. We sipped this delightful sparkler while visiting with our fellow diners, and nibbling on Hors D’Oeuvres including house-made cured meats, and roasted and marinated vegetables. Soon enough, we were summoned to the dining table, located in a long corridor in the cave. The service was excellent, the wine free-flowing, and the food exquisitely prepared. We both agree this was among the top five meals we have ever experienced; and toward the top of that list, to boot! The first course was a roasted Brussels Sprouts salad with Black Pig Bacon, Asian pear, Marcona almonds, aged sherry vinegar, and Bohemian Creamery Capriago. This amazing salad was paired with the Thomas George Estates 2015 Chardonnay, Sons & Daughters Vineyard. It was during this course that we learned that all the pork served during the evening was hand-raised by our chef, Duskie Estes, of Zazu Kitchen & Farm in Sebastapol, California. Now that’s farm-to-fork, local food! The main course was Cracklin’ Pork Belly (from our friendly neighborhood porker) with Star Anise Liberty Duck; a full leg quarter; served over black rice, with pomegranate and watercress. I wasn’t sure what to expect with the pork belly, but I was not disappointed! As much as I love duck, this crispy chunk of heaven was out of this world! Paired with the Thomas George Estate 2014 Pinot Noir, Baker Ridge Vineyard, this was an entrée and pairing worth writing home about! Amid friendly conversation, ample refills, and boundless frivolity, I wondered if it could get any better. Leave it to the good folks at Thomas George Estate and Zazu Kitchen & Farm to up the ante with dessert. Backyard Quince & Apple Tartin with Bourbon Gelato. Why, yes, I believe I will. Paired with the most amazing 2012 Late Harvest Viognier from Baker Ridge Vineyard, I thought I’d died and gone to heaven. Just look at the color of that Viognier! Divine! Even after dinner, the hospitable staff kept our glasses filled, until it was time to, sadly, re-board the bus for the ride back to the hotel. But first, swag bags! We each received a gift of a bottle of Thomas George Estates 2016 Rosé of Grenache, a numbered bottle of their Baker Ridge Vineyard Olive Oil (delicious), and for a longer-lasting keepsake, a Thomas George Estates t-shirt. Back on the bus, we basked in the afterglow of a magical, memorable evening. One we will not soon forget. ​Franc Dusak has been one of my favorite winemakers for some time, and he continues to impress. Under the umbrella of NakedWines.com, Franc produces excellent wines from a number of different varieties of grape, and some out-of-this-world blends, too. One of my favorite wines in his portfolio is his Viognier. I’ve reviewed Franc’s Viognier before; the 2015 vintage. I recently acquired a bottle of his 2016 vintage, and I was so impressed I simply had to share about it! Sporting a brand new label design, Franc’s Viognier Sonoma Valley 2016 is just as enticing, refreshing, and delicious as 2015…maybe more so! Franc reaffirms my newfound love for Viognier with this creation. In addition to being tasty and satisfying on a hot, late-spring day, it is quite versatile with food pairing and makes a terrific addition to a variety of dishes. Personally, I clearly see the passion in Franc’s wines. Here’s my review of this amazing Viognier. I’ll be buying a case of this to get me through the long, hot summer! Another Franc Dusak hit! Franc’s Viognier is always delicious and this vintage is no exception. Golden straw color. Aromas of nectarine and honeysuckle. This wine is florally aromatic; it smells so delightful it could be perfume. On the palate, flavors of nectarine and peach, elderflower, pear, and floral notes. Started well chilled, as it warmed some apricot started to emerge. With a round mouthfeel, tangy acidity, and medium body, this is a great wine for food. We had it with grilled miso shrimp and asparagus, with spinach salad and it was amazing! Make no mistake: this is not a “sweet” wine. It is fruit forward and floral, which may be perceived as sweetness. But it is a dry, delicious white wine. Franc, I tip my hat to you, sir! This wine is still available from NakedWines.com. If you aren’t already a NakedWines.com Angel, click here, or the banner below, for a voucher worth $100 off your first order of $160 or more! You’ll be glad you did! Awhile back I reviewed Franc Dusak’s Sonoma Zinfandel 2013, and as I usually try to do, included a brief introduction to Franc himself. I’ve had a number of Franc’s wines, and have been over-the-moon for all of them. I recently tried his Sonoma Valley Viognier 2015, and this white wine is no exception. It is spectacular! I am now convinced that my original aversion to Viognier resulted from low quality, rather than the varietal itself. Every NakedWines.com Viognier I have tried has been simply amazing! 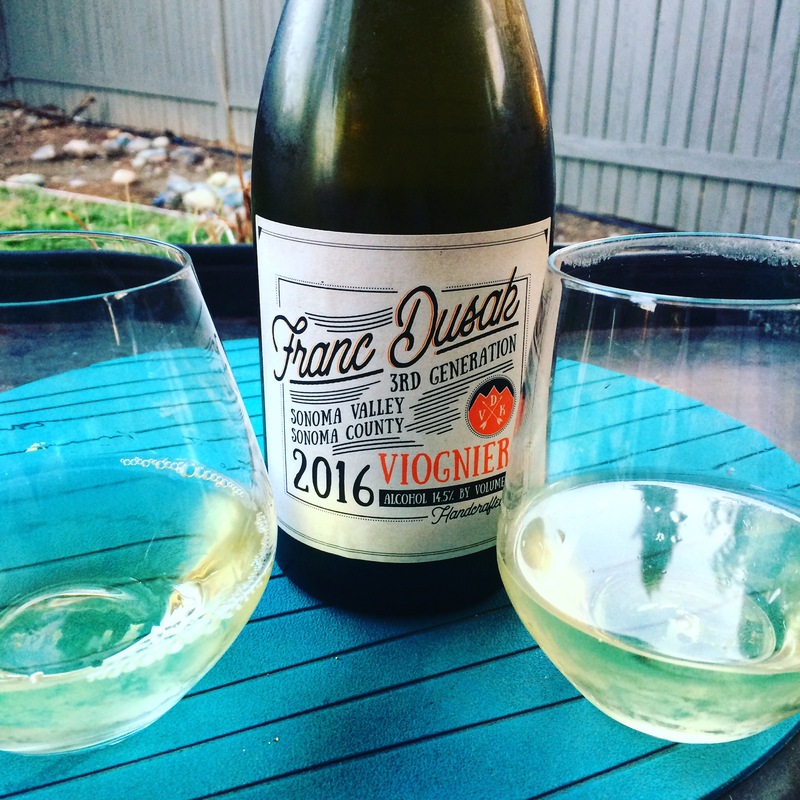 Franc’s 2015 is no exception, and Viognier is now one of my favorite white wines! Light straw color, with aromas of honeysuckle, white peach, and elderflower. On the palate, Golden delicious apple, white peach, elderflower, and a hint of fresh pineapple, mingling with fresh, light acidity; it’s like drops of gold on the tongue. Light to medium bodied and pleasantly dry, this is a stellar Viognier. Served with Chicken Breast with Basil-Wine Sauce (the Viognier is in the sauce!) it is an amazing, heavenly experience. NakedWines.com frees talented winemakers from the burden of marketing and sales, and allows them to focus on what they do best: make unbelievably delicious wines. These are all small batch, boutique wines, that Angels (members) can purchase for amazing, discounted prices. If this Viognier, or any of the dozens of other phenomenal available wines, sound like your cup of tea, follow this link for a voucher worth $100 off your initial order of $160 or more. Free wine? It doesn’t get better than that!